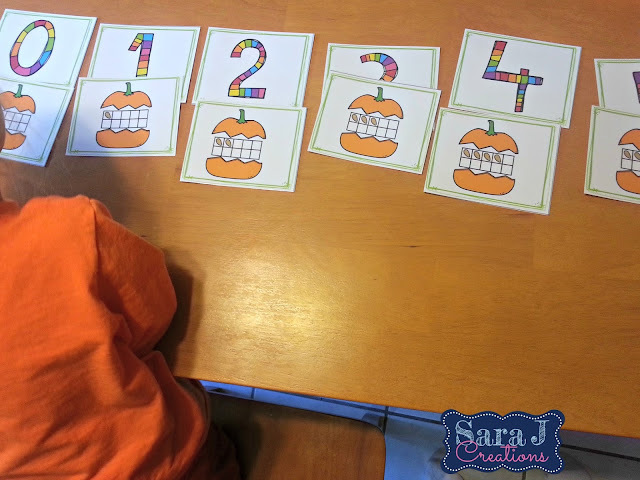 When I designed our fall/autumn homeschool preschool unit, I wanted to focus on numbers 1-5. 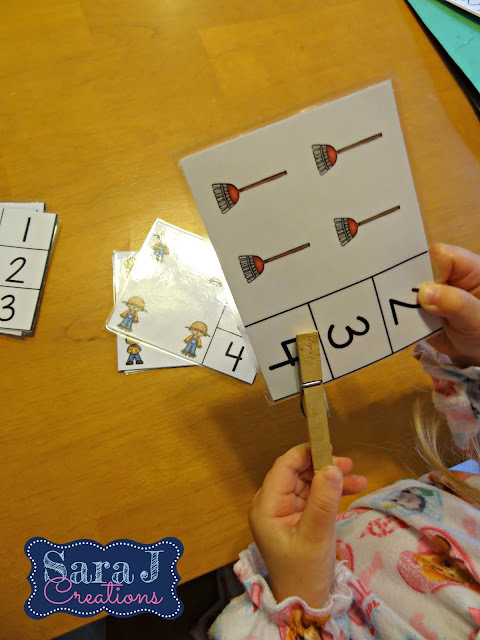 I wanted K to focus on identifying the numbers, one to one correspondence as she counted each item, and then matching the number to the total amount she counted. To practice these skills, I made a few different activities for her. *sorry about the glare on some of these pictures. The lighting in our kitchen whole house leaves much to be desired. 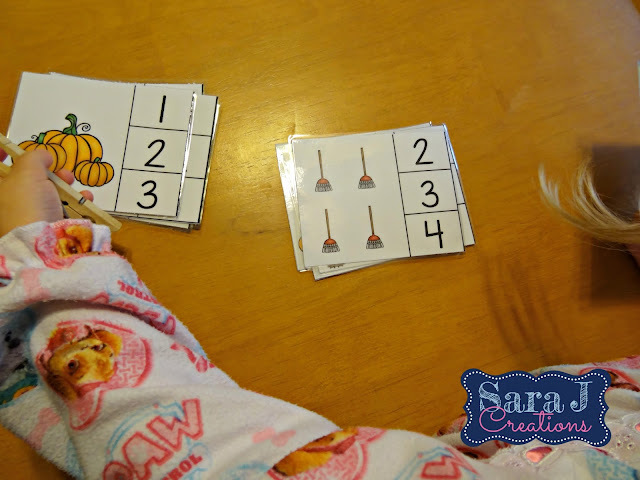 For this activity, we counted the seeds in each pumpkin tens frame and then matched it to the corresponding number. I showed K how to do the first one and then turned around and she had quickly matched them all up. I thought she would need more instruction and practice than that. Next time, I am going to use the cards as a memory game with her and place them all face down and take turns turning over two cards looking for a match. 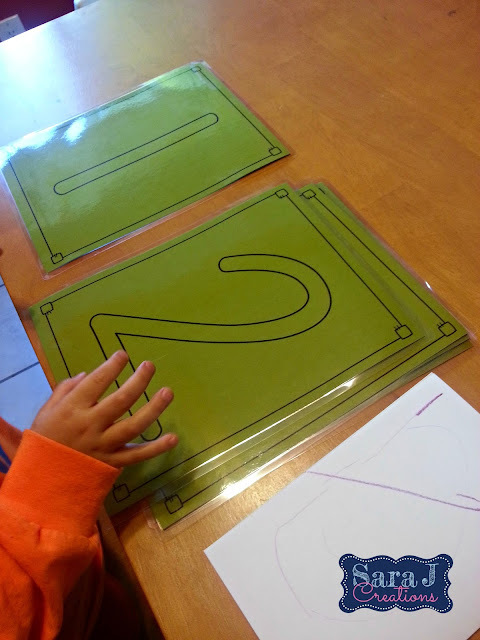 I laminated the cards so that we can use them as playdough mats as well. Just roll the playdough into snakes and create each number. We can also trace with dry erase markers now that they are laminated. Have you ever tried clothespin clip cards? 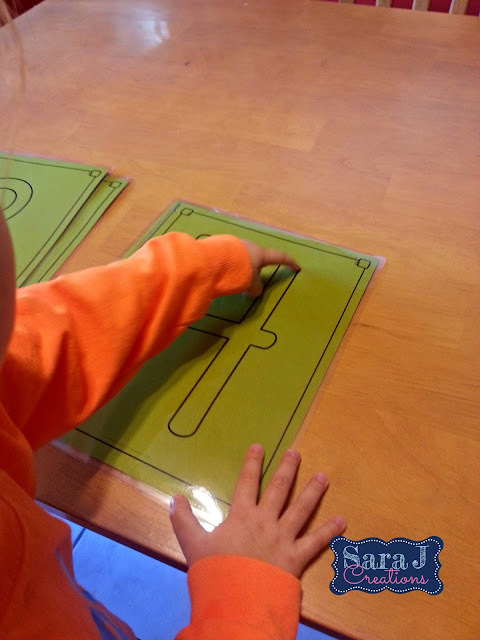 They are so easy and a fun way to practice different concepts and fine motor at the same time. 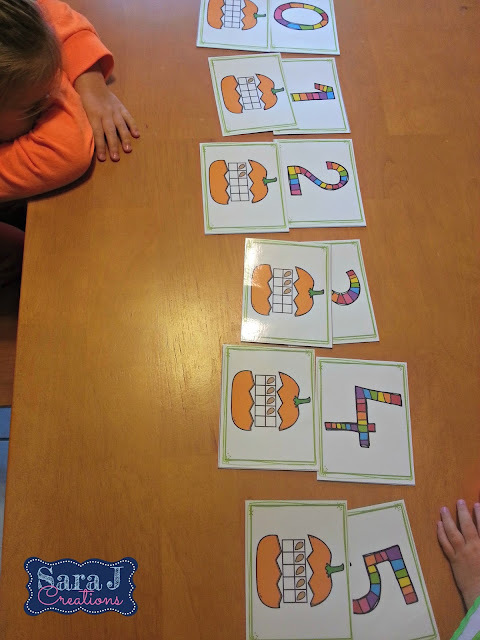 For these, K had to count the objects, find the number that matches it and put the clip on the right spot. I made these with a self check option on the back. Once K picked her answer, she could flip over the card to see if it was clipped to the yellow square. If it was, she had the right answer. If not, she had to try again. 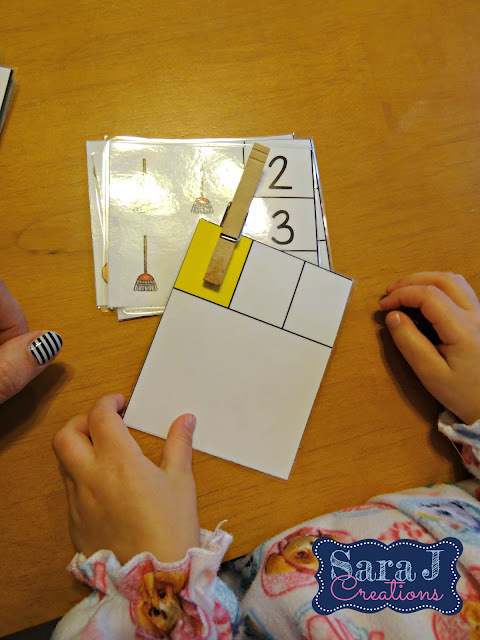 This makes it great for a center activity and something that even young learners can do on their own and check their work. Those were a few of our favorite math activities that we've worked on the past few weeks. Technically it is still fall until December, right? So I can totally pull all of this out and keep using it through November. Pumpkins and leaves are still seasonally appropriate around here! !